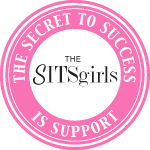 Happy SITS Day at Sweet Midlife! Serving up twin realness since 1971! Nancy the comic strip and a gypsy in a Holly Hobby turtleneck walk into a room. There is much cuteness and nothing much gets accomplished. OK, so technically we haven’t been blogging that long. There were no blogs in 1971, and there certainly weren’t computers when we met, in a nice warm womb in Baltimore. But blogs are really just communication, and we, Lynne and Leslie, the twins who write this blog, have certainly always done that. It was probably something like “You’re taking up too much room in here,” which isn’t all that eloquent or blog-worthy. So here we are, nearly 42 years later, both married but living in different states. One’s a mom. One’s not (yet). One’s a teaching artist, the other a newspaper reporter. Both got married in their 39th year, barely escaping the Spinster Buzzer (which sounds like the legs of a rocking chair going over the tails of many cats.) We’re both kinda goofy, but have a lot to say about relationships, friendships, dirty dishes, reality stars who won’t show up, death, life and cheese. Interestingly, this used to be a blog about being older brides, and we still talk about the state of relationships that bear the benefit of having (alleged) wisdom under our belts. But weddings are just the candy-covered frosting of the rest of your life, and that’s where we like to be. The cake’s the good part. So come on in and hang out. Tell us what you think. Give us some advice. Encourage Lynne to finish that framed calendar thing she’s been trying to craft. Make Leslie go to boot camp. Tell us where the good cheese is.